Before I started taking my health and the food I eat seriously, eating was like facebooking – I would click the like button or just ignore the food completely. All my eating habits were developed around me liking the taste, without any thought to the time of day, the nutrient values, or challenging my taste buds to new tastes. This meant I was eating simple carbs paired with salty and spice meats – pizza, burgers, tacos. I was basically eating the same food every day presented differently. 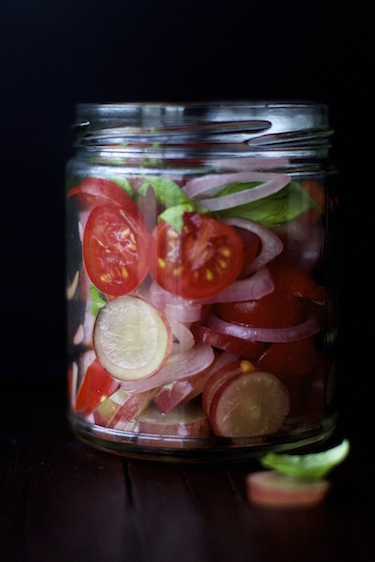 Eating healthy meant I was using seasonal ingredients either in raw form, or cooked lightly. This started the process of mindful eating. Instead of just saying I don’t like the taste, now I was trying to define the taste more – was it salty, sour, sweet, bitter? The culinary school took it to a whole different level! The instructor would ask us to smell a wine and say what it smelled like – was it nutty, fruity, woody? You take a sip next and tell him if the smell and taste match, or if the experience surprised you. You eat a leaf of baby kale and compare the taste with the taste of chard – its as if someone had woken up a section of my brain that I never thought of using! This is how a grown up should experience food! Celery – this one ingredient was to me an ugly cousin of chicken wings. I thought that the sole purpose the restaurant put some celery sticks on the platter was to make me not feel guilty about eating the fried wings. I might even eat one of those sticks – with a very unhealthy dose of blue cheese dipping sauce, of course. Celery has gone from an apology on a plate to a favorite ingredient of mine! I use it in my juices and stews regularly. If you haven’t tried cooking with the celery root, I highly recommend it. The flavor can be described as the combination of celery stick and parsley, with some nuttiness. Celery root which is also known as “celeriac”, is high in dietary fiber and low in cholesterol and saturated fat. It is an excellent source of Vitamin B6, which is essential in the health of red blood cells, muscles, nerves and immune system. 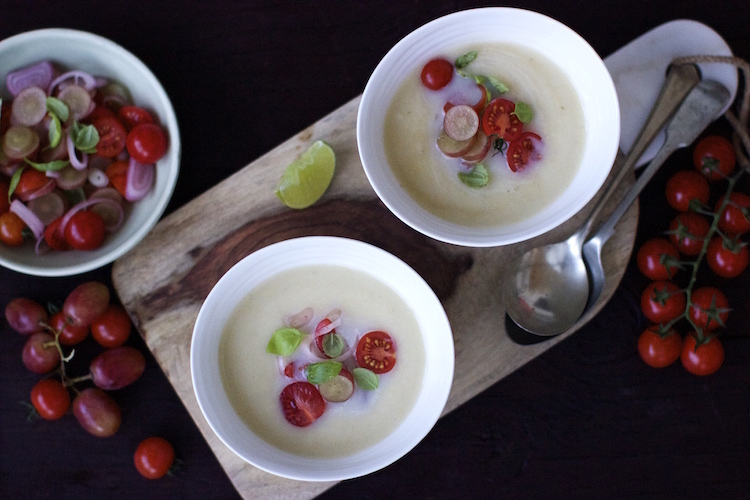 The chickpea in the soup makes it high in protein, while the celery root gives it creaminess. 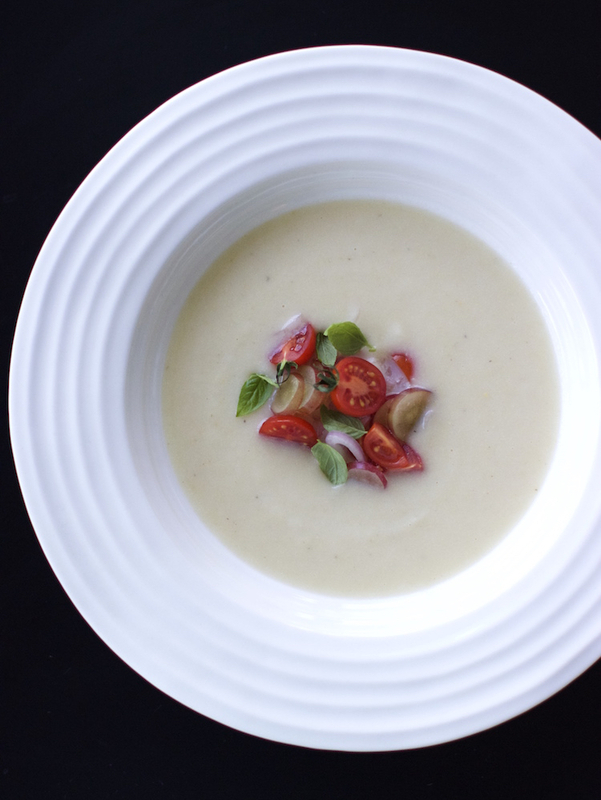 I have used the tomato, grape and shallots for texture and sweetness.This is a filling soup, perfect for a cold winter day. Stay warm friends! Heat coconut oil in a big pot. Add chopped onion, garlic and thyme sprigs. Sweat on low heat until onions are soft, about 10 minutes. Add ground cumin, nutmeg and black pepper, sauté for 2-3 minutes. Add chickpeas, diced celery root and vegetable stock, bring to boil. 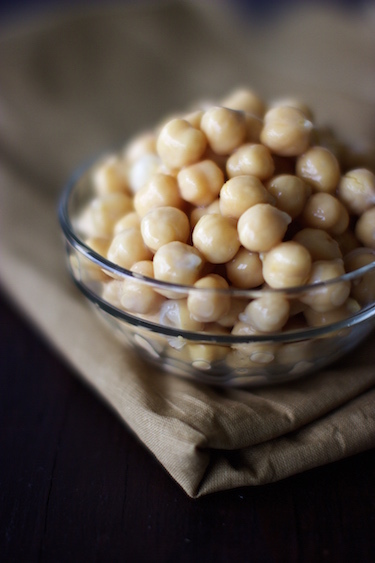 Reduce heat, cover and simmer on low heat for 30 minutes until celery root & chickpeas get soft. Remove from heat. Once the mixture is cool enough to handle, purée in blender. Season with salt, pepper and lemon juice. 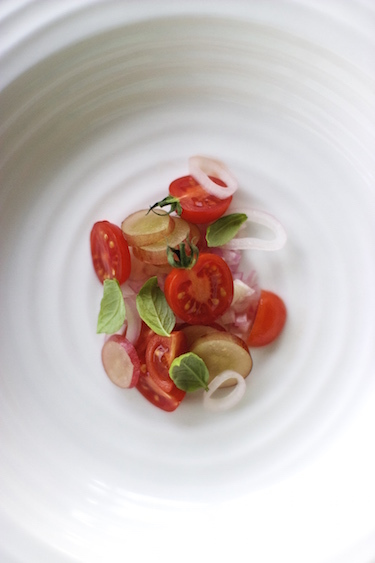 Mix chopped cherry tomatoes, grapes, shallots and basil leaves in a bowl. Season with salt, pepper and lemon juice. Garnish your bowl of hot soup with 1-2 spoons of salsa. Never cooked with Cellaric root but you have tempted me with soup, it seem to pair beautifully with chickpeas..
Quite intriguing. 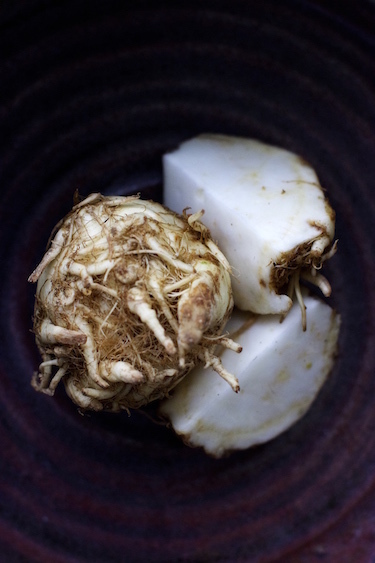 I need to try celery root asap. Fabulous soup.. Liking the combination.